“A brand is no longer what we tell the consumer it is, it is what consumers tell each other it is”, a quote I came by recently by Scott Cook. Having been around for 15 years, Nic & Wes Builders has always pride itself on reputation and customer experience. 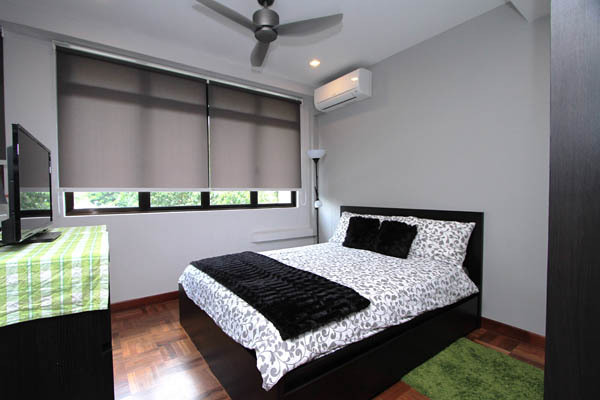 We are not perfect to say the least but we do our best to provide the client a pleasant home build experience. It is that very experience that has turned many of our cliental into friends. Friends that have been kind enough to refer or spread the word about their Nic & Wes experience. 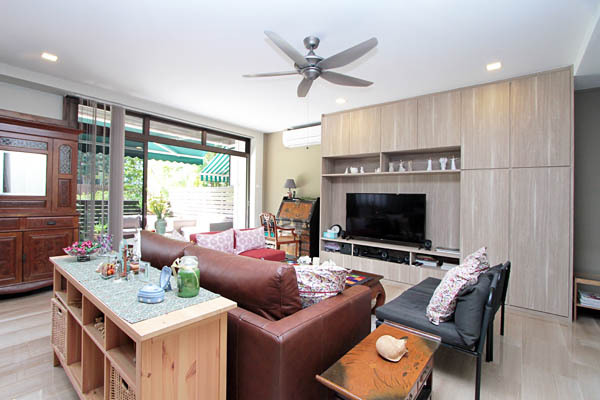 The homeowners of this apartment unit, similarly had friends whom built their homes with us prior, came to us when they required a makeover. 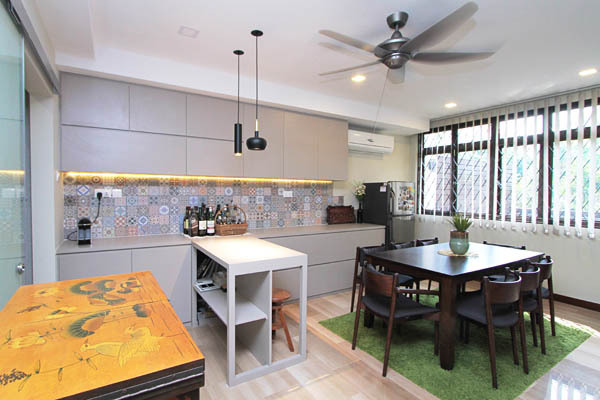 Nestled in a tranquil part of the North-East of Singapore, this older development’s maisonette unit saw much potential that was yearning to be refurbished. The living room is a spacious area. Designed with the Contemporary theme in mind, the colour palette trends on light earthy tones coupled by hints of eclectic charm. 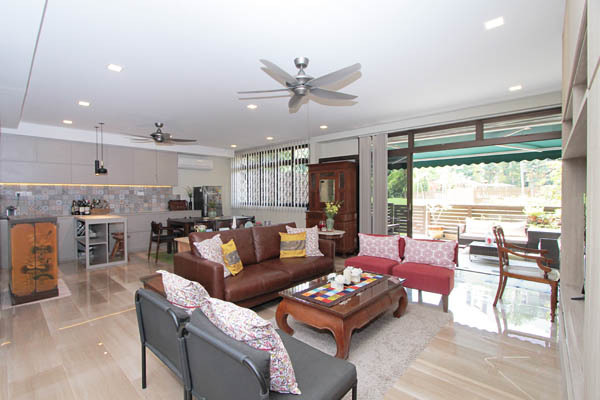 The existing marble flooring was re-polished to bring back its lustre. A television cabinet was built complete with additional full-length doors for storage. Sliding doors lining the living room wall lead to the outdoor balcony space amidst a tranquil grass yard. 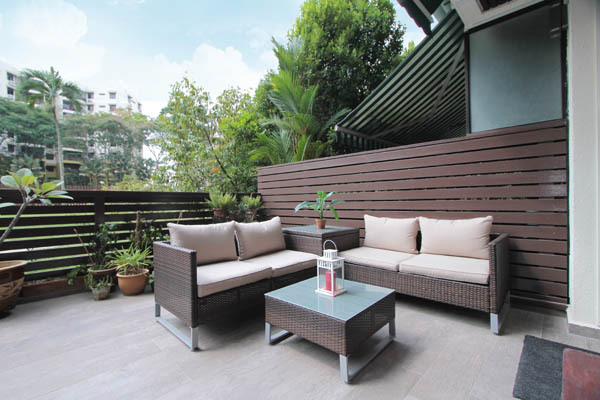 The balcony floor was retiled with oak-hue wood tiles that have become a popular alternative to wood decking. 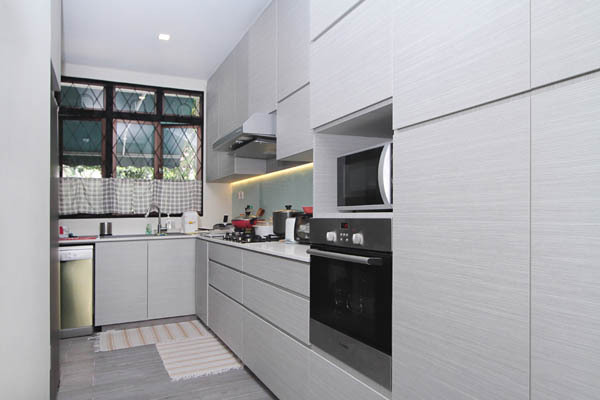 Behind the living room, cabinets line both the top and bottom of a back wall maximising the use of space and doubling up as both storage and kitchen. 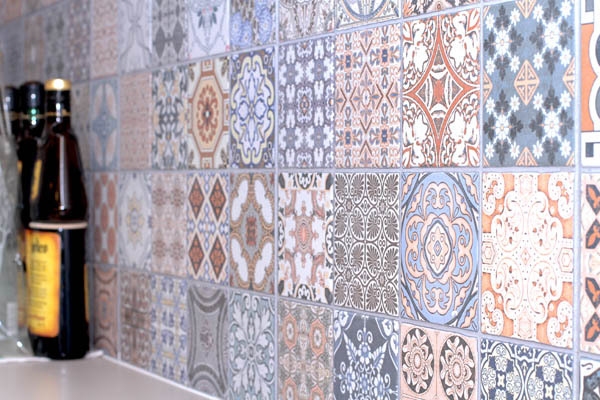 The eye-catching backsplash of mixed tiles is a trending feature within the home. The generous countertop space situated near the dining becomes the perfect buffet hutch. Moving to the opposite end of the dining space lays the L-shaped kitchen. 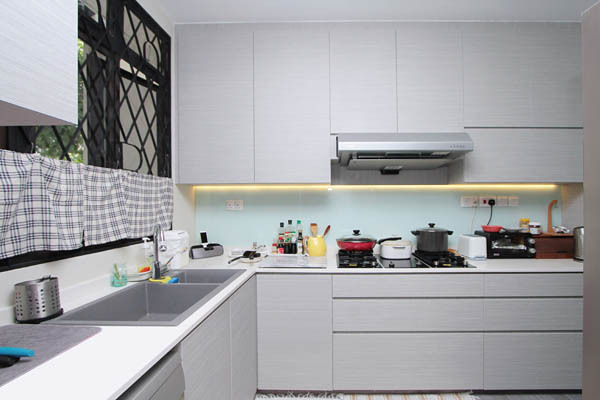 Compact and narrow, the kitchen is decked with similar light-hued cabinetry while the floor re-tiled. On to the second floor, the parquet was maintained but re-varnished. 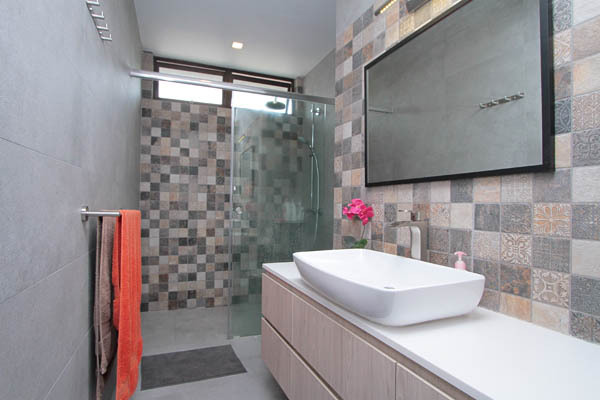 The bathrooms experienced a thorough revamp. 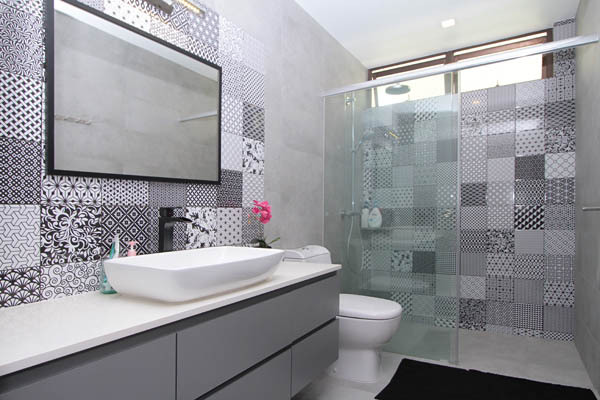 Floors and walls were re-tiled in similar style with a focal feature of the mixed tiles amidst an urban grey tiled backdrop which provides that right balance of solid and patterns. 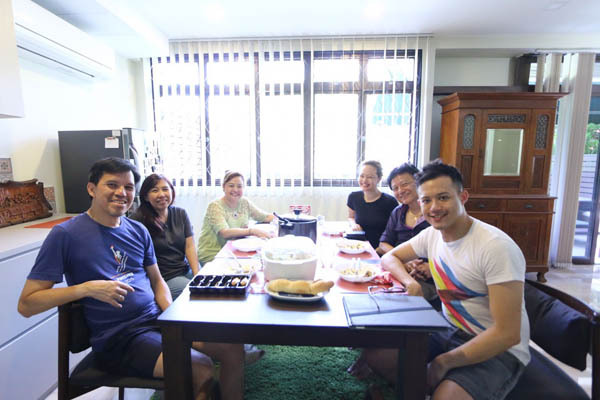 After completing our media work at the home, the homeowners very kindly prepared a meal where we got to enjoy the company, a scrumptious meal and take in the newly renovated home. Now is the laborious task of unpacking before we can truly enjoy our new home! You all should consider an end to end service packing and unpacking service! Much thanks to the team, the renovation process was almost painless and efficient. Thank you Bob and Askae for the help with the conceptualising and planning. Our special thanks to Rajan, who’s been the main driver of our project. He’s been very patient and accommodating with us throughout the entire project. We are very grateful and it’s been a real pleasure working with him. No adjustments was too small for him as he tended to all the details. Thanks again! Wishing you all every success! Perhaps our paths will cross again some day.